If you’ve ever pushed a bike down a hill, you know that two-wheeled vehicles can balance themselves when traveling at higher speeds. It’s when you’re riding slower that balancing gets a little more challenging, unless your motorcycle’s equipped with Honda’s new experimental Riding Assist technology so it automatically balances itself. Based on technology developed for Honda’s ASIMO robot and its self-balancing scooter called the UNI-CUB, the Honda Riding Assist technology doesn’t use traditional gyroscopes for balance since they can add a lot of weight to a vehicle. 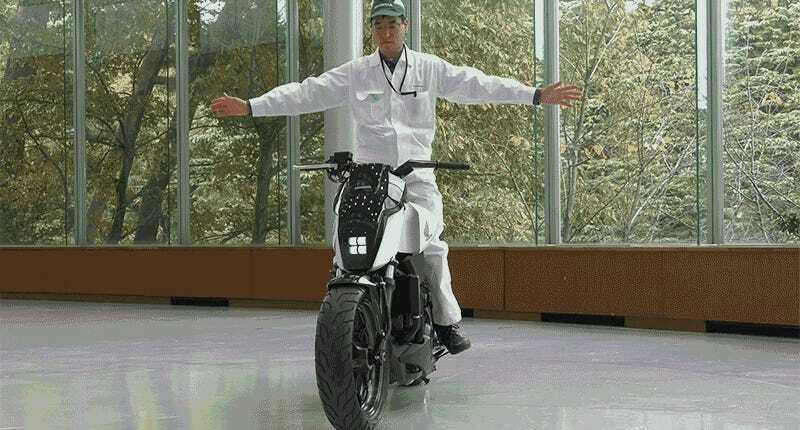 Instead, when the experimental motorcycle Honda has developed is moving at speeds of less than three miles per hour—like when pulling out of a garage or starting and stopping at a street light—the angle of the front fork is automatically lowered to help improve stability. At the same time, minute left and right steering adjustments are automatically made to the front wheel to ensure the motorcycle always maintains its balance—with or without a rider on board. There’s no word on when the Honda Riding Assist technology will be available on the Honda’s motorcycles—if ever. But it does help explain why company’s spend so much money on R&D projects like ASIMO or the UNI-CUB, allowing it to develop new and unique technologies that eventually trickle down to consumer-available products.